Warner Bros. Home Entertainment have released the first trailer for Batman Vs. Robin, the upcoming direct-to-home video feature-length animated movie. The film, the latest in their DC Universe line, is a direct sequel to Son of Batman, which told the origin of Damian Wayne. You can check the trailer out below, via IGN. The story will incorporate elements of Scott Snyder and Greg Capullo's run, most notably the Court of Owls; Suburgatory's Jeremy Sisto will play Talon. Other newcomers include Grey Griffin (formerly Delisle), who recently voiced Lego versions of both Wonder Woman and Lois Lane, will appear as a character named Samantha, while "Weird Al" Yankovic will play The Dollmaker, a Batman villain with various iterations, including versions that have appearedrecently on both Arrow and Gotham. Robin Atkin Downes of Superman vs. The Elite is a character named Grandmaster and Peter Onorati voices a man named Draco. 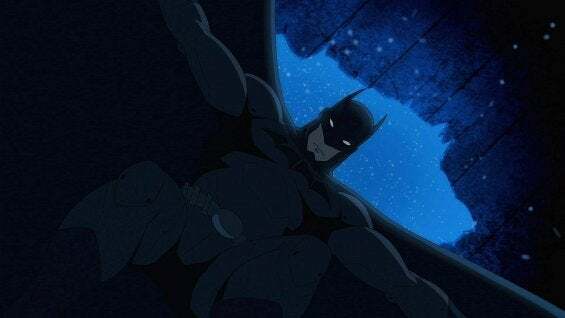 Veteran Batman voice actor Kevin Conroy will guest star as Thomas Wayne, Batman’s father, similar to the way that the final video in the previous "generation" of DC Universe animated features -- Justice League: The Flashpoint Paradox -- cast the son of longtime Superman actor Tim Daly to play the Superman of the Flashpoint Universe. Jay Oliva, the director of five previous DC Animation features, is helming the project from a script by Justice League 3000 co-writer J.M. DeMatteis.